A former newspaper guy transitioning to multi-platform journalism, I love, love, love print-digital mashups. So, naturally, I’m excited that QR codes, widespread in Japan and Europe, seem to be catching on in North America. The two-dimensional bar codes, invented to track auto parts, are being embraced by content producers and marketers because they can be processed by smart phones to steer users to URLs, contact information, map locations and other data. The South By Southwest festival this year used them on conference name badges. A Canadian newspaper recently started printing the codes next to articles to connect print readers to supplementary online content. Anyone in Times Square a couple weeks ago might have noticed QR codes (QR is short for quick response) in advertisements on one of the district’s many electronic billboards. 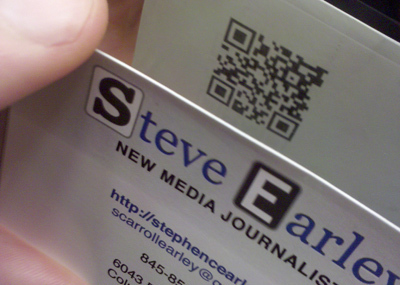 I decided to apply the technology much like SXSW did and embed my contact information on the back of my business card. To do this, I used a free third-party beta service called PingTags, which links with users’ LinkedIn accounts to create sleek mobile contact pages. PingTags automatically generates the corresponding QR code and even tracks page views for you. DIYers can make their own QR codes here. There are many free QR code generators available online, but this one has the added feature of allowing creators to change the destination of the code at a later date. The business card itself (the back is reflected in a mirror) is in the image at the top of this post. The QR code pointing to my PingTags page is at left. If you have an enabled smart phone, go ahead and try scanning the code. If you don’t have a QR reader app, you can download one here. If you don’t have a smart phone capable of reading QR codes, check out the page here. Make your business card more interesting and more useful to your contacts. Make a static business card dynamic by changing the content the code points to. Look technically hip without needing a lot of technical know-how. Many users don’t have phones capable of reading QR codes or don’t know that they do. Other mobile apps like Google Goggles and Bump can arguably more efficiently accomplish the functionality achieved in this example. Be creative! Put QR codes on T-shirts, napkins, greeting cards, Twitter icons, tattoo them on your skin. The sky’s the limit. OK, maybe not that last one. Yes, but bear in mind that a lot of people look down upon QR codes as gimmicky — and often times, they’re right. Don’t use a QR code where a shortened URL will do. I’ll have to get out with a tripod sometime and try it the scratch-made way, but today I faked a high dynamic range photo in Photoshop using this tutorial. Mimic the human eye and then some by making extremely light and extremely dark areas visible at once. Potentially rescue poorly exposed images. Fun to play around with, but for everyday Web publishers, limited practical applications. It takes time and talent to keep the HDR image from looking too fake. Even proper HDR images are controversial in some photography circles. Experiment. Don’t be scared to deviate from the tutorial recipe. Every photograph is different. Plus, there’s always several ways to skin a cat in Photoshop. Oh, and always save your original .psd! To mess around with, why not? A more subtle application than this could be used to correct over/under exposure in photo illustrations. This technique should be avoided in news photos, however; it’s distorting reality. I checked out Google’s Motion Chart gadget — for illustrating changes in multiple variables over time — in school last fall but never produced a complete, functioning chart. Today I did. 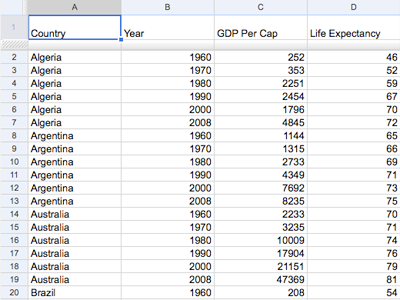 It visualizes each of the 32 World Cup nations’ per capita GDP, life expectancy and World Cup wins for the last half-century. Following the format above, enter data into a Google Docs spreadsheet. From the “Insert” menu, choose “Gadget” and click on the “Motion Chart” option. For range, enter the top-left cell of your data set and the bottom-right cell of your data set (including field labels), like this: “Sheet1!A1:E193” Click “Apply”. Create revealing interactive charts without any coding. Can import .csv files directly into the Google Docs spreadsheet, saving you from tedious data entry. Chart automatically changes as your spreadsheet does. Requires large data sets to be effective. Can improperly suggest correlation, causation or trends. Don’t think of Google Motion Chart only as a presentation medium. It can be a useful reporting or research tool for spotting noteworthy patterns. Yes, but only for visualizing data over significant time spans — whether you’re dealing in hours, days, months, years, you’re going to want a lot of reference points — where trends will be noticeable and meaningful. It’s Friday, and apparently there’s some kind of big sports tournament going on, so, I kept today’s DailyDev simple. I made a custom Page Not Found 404 error page for my portfolio site — something I should have done a long time ago. Design one page, cover an infinite amount of potential broken links/typos/misspellings. Make the error a little less jarring for users, provide guidance that may help them find a relevant page, maybe even make them laugh a bit. Encourage (or automate [No. 6]) feedback so you know when your site’s not working properly. You’re spending time making a page you never want anyone to see! Many who do see it are probably just going to instantly hit the back button anyway. If your Web server gets lots of requests for invalid files, a larger custom error page rather than the generic one can start nipping away at your bandwidth quota. If your Web host has you edit your .htaccess file through a form interface, like mine does, you still need to make sure you precede the custom 404 page’s filename with a slash to indicate it’s in the root: “/notfound.html”. Location, location, location. With the coming mobile revolution, I’ve written before, the mantra increasingly applies to a lot more than real estate. It behooves Web publishers to start semantically geotagging their content. For today’s DailyDev, I assigned locational information to a Web page, a WordPress blog post and a Flickr set. I used geo meta tags to indicate the location of the speech that was the subject of this live coverage page. The “geo.position” meta tag uses latitude and longitude coordinates. I grabbed the coordinates for the event location from Google Maps. I simply switched to “My Maps,” toggled to satellite view, placed a marker over the appropriate building and grabbed the coordinates by clicking on the marker, then on “more,” then on “send.” The latitude and longitude are part of the link in the “Message” window. The “geo.placename” and “geo.region” meta tags use city, state and country information. Nothing fancy there. Putting it all together, I added the three meta tags to the <head> section of my HTML document. WordPress support has an easy-to-follow tutorial on how to enable and apply geotagging. Once geotagging is enabled, a “Location” window will appear at the bottom of all “Edit Post” pages. You can enter in a street address, select a location on a Google map, or have your computer detect your location. As long as “This post’s location is public” is checked, the location will be recorded the next time you save your post. I geotagged my post from last month’s FutureWeb conference at the Raleigh (N.C.) Convention Center. Geotagging Flickr content is even simpler thanks to the photo sharing site’s interactive map interface. Log in to your Flickr account and click “Organize & Create” in the menu at the top of the page. 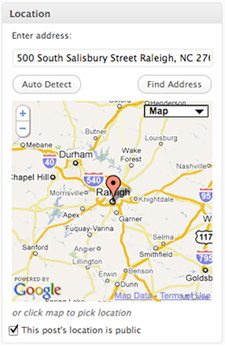 Click the “Map” tab at the top of the screen and drag and drop your photos into the appropriate locations on the map. You can quickly navigate to a specific address by typing it into the search box in the upper-right. Flickr permalinks geotagged sets for easy sharing. This set documents a late winter snowstorm in Laurel, Md. Manual geotagging is pretty simple to do, as the above examples indicate. More and more Web services and platforms are automating geotagging. If you tweet (eat your heart out, New York Times), for instance, you’ve probably noticed Twitter’s location feature. Geotagging makes your content more useful to you and others, especially mobile users. No standardized way of geotagging Web content has emerged. Services that attempt to automatically pick up users’ location are often inaccurate. There are a whole host of privacy concerns for those sharing as well as collecting locational data. The Wikipedia pages for public places include their latitude and longitude coordinates, though these too can sometimes be off. Yes. The location train is revving up. It’s time to get on. ProPublica’s award-winning ChangeTracker mashup, which it uses to follow edits to The White House’s website, can still be cloned to monitor the site of your choice, just be sure not to try to follow this tutorial, as I attempted to. The Yahoo! pipe it says to use is busted. Here are the revised steps, still largely based on the aforementioned tutorial. Create a free Versionista account. You’ll be taken to a new page. With a free account, you can monitor up to four more URLs if you wish. If they’re from the same site you just entered, add them here. If they’re from a different site, complete step four, then repeat steps 2 through 4 for the other site. Click “options” at the top of the screen. Check “Make this site archive public.” Copy the url under the checkbox and save it for later. Go to ProPublica’s ChangeFeeder page to create an RSS feed for each site you’re monitoring. Paste into the box the url you copied in step 4 and append it with “all”. It should look something like “http://versionista.com/pub/19600/1/all&#8221;. To give the feed a cleaner URL and to receive stats for it, run it through FeedBurner. If you wish, use FriendFeed to publish your feed on a Twitter stream. 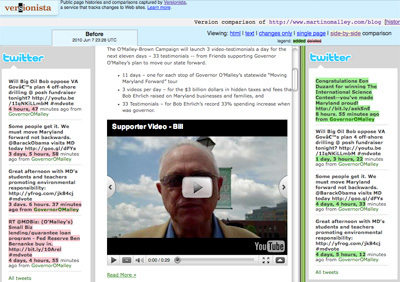 A Maryland native, I decided to use ChangeTracker to monitor changes to recent blog and news items on the campaign websites for Maryland’s governor and his challenger, who are reversing roles from four years ago. Neither of these was working perfectly last I checked. You can get an idea for what’s supposed to happen by clicking “this change” for the “June 7, 2010 7:28 PM” change on the O’Malley feed. It’s a lame change — new tweets! — but you get the idea. Once you find out the tutorial you’ve been trying to follow is no longer operable, this isn’t that much work to pull off. You can catch website changes you’d never notice unaided, all without visiting pages umpteen times a day. Versionista helps transparency advocates practice what they preach by providing a way to share interactive archives of their own websites. Like I said, I still haven’t gotten this working perfectly. This could be a problem on my end, but I’ve already invested more time than I intended in this exercise. To take full advantage of ChangeTracker and monitor more than five Web pages requires a paid Versionista account. Even with a tool automating the first step, culling through dozens of mundane updates to find one interesting one is still tedious! Think about the sites you choose to track. ChangeTracker works well for static pages with lots of text, less well for dynamic pages with a lot of multimedia. For those with more patience and time than me, definitely. ProPublica has used ChangeTracker in its reporting several times. ChangeTracker is a useful enough tool for novices but there’s no telling how expert developers could extend what Versionista and ProPublica have put together. For my next DailyDev, I’m working on cloning ProPublica’s ChangeTracker mashup to track changes to the campaign websites of Maryland’s governor and his challenger. To make sure it works and to have something to show, I’m waiting for the pages I’m monitoring to be updated. So, I’m in a holding pattern on that. In the meantime, here’s a simple CSS technique I used to get rid of orphans in a blog post on my portfolio site. You got it, the orphans are the last lines of each list item. Not pretty, right? Fortunately, I happened upon this CSS tutorial showing how to use the overflow property to get rid of them. Stop thinking in terms of print versus Web, us versus them. Start thinking in terms of one multi-platform news organization. 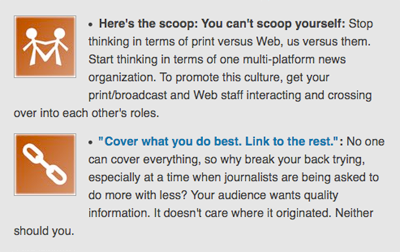 To promote this culture, get your print/broadcast and Web staff interacting and crossing over into each other's roles. I could have accomplished the same thing with a class rule, but, as you can see from the HTML, I already had a class applied to the list items. Can be accomplished with minimal extra markup. If every other list item or paragraph requires an orphan-canceling div or class, your markup will start to get cluttered. If you have lots of orphans, tweak your design and leverage the CSS cascade to keep your markup clean. In my example, for instance, if most of my list items had orphans, I might consider increasing or decreasing the padding or margins of their parent elements, or just forget about having the text wrap so each list item automatically squares off. No, not that kind of running backward. Though, in my previous city, there was a dude you’d see doing that all the time. Seriously. On a whim today, I reversed my regular running route. The route I’ve jogged dozens of times in all kinds of weather. The route, in the standard direction anyway, I could probably run in my sleep. Boy, let me tell you: It was like running it for the very first time. Physically and visually, it was a completely different experience. When the start of downhills become the end of uphills, you change how you manage your workout. When the near side of the street becomes the far side of the street, you notice landscaping, architecture, entryways you’ve never noticed before. The best part: I expect today’s experience will help me better manage and better enjoy the route in its regular order. The novelty won’t be as great next time but I’m sure to reverse the route again. I also will try to make a point to run backward, so to speak, in other areas of life, turning habits, routines, workflows on their collective heads. I’ve already been doing this vocationally. In fact, one of my favorite parts of the interactive media master’s program I just completed was how telling stories on unfamiliar platforms improved my storytelling across the board — even in traditional print pieces, which I’ve been writing since high school. Yes, running backward will move you forward. I’ve been meaning to take a stab at a custom Twitter background for a while but was always unsure what dimensions would be best to accommodate varying screen resolutions. This Mashable post, which I used as my guide, recommends 1600px by 1200px. The left column where text popularly goes should be less than 240 pixels wide, the post suggests. While branding is typically the main motivation behind custom Twitter backgrounds, I was going for function more so than form here. I have two Twitter accounts, a personal account and one I created for school. I maintained both during the first part of my grad program but have since started feeding all my everyday tweets to my personal handle, reserving my old school account for live tweeting. I wanted the custom background to convey this so that anyone who stumbles upon my school account doesn’t miss that it’s not my main handle. I used Photoshop to create the image. I employed a gradient background and some basic layer effects on the text and icon to achieve some depth. The Twitter bird is from this free set. Give your Twitter page a personal touch or communicate important information with minimal extra effort. Brand yourself or your organization across multiple spaces by matching the look/feel of your website, print campaign, etc. Non-designers can outsource the job to free online background generators. Since you’re dealing with a fixed image, it’s impossible to get the dimensions perfect for every resolution. Mobile users, a fast growing segment of your and any audience, don’t benefit from your custom background. Nor do your established followers, really. Once I start following someone, at least, it’s not often I click through to his or her page. You can’t hyperlink the text. A good use of Twitter backgrounds is to promote your other online spaces, but, whenever I see this I have to fight my instinct to click on the words. Don’t make your background too texty. It’s against the 140-character spirit of Twitter. For organizations, definitely. It’s a can’t-miss opportunity to extend your brand and get important information in front of your audience. An attractive background that efficiently communicates what your org is all about can make all the difference when a user is deciding whether to become a follower. For individuals it can be beneficial for the same reasons, but, to me, overly packaged personal backgrounds often come across as pretentious — especially those with large photos of the user identical or similar to his or her profile picture a few pixels away. I’m a fan or more subtle personal backgrounds — especially large landscape or cityscape photos — that serve a design function and reflect the user’s personality but let his or her tweets, profile bio and website link speak for themselves. Macbeth was very ambitious. This led him to wish to become king of Scotland. The witches told him that this wish of his would come true. The king of Scotland at this time was Duncan. Encouraged by his wife, Macbeth murdered Duncan. He was thus enabled to succeed Duncan as king. Encouraged by his wife, Macbeth achieved his ambition and realized the prediction of the witches by murdering Duncan and becoming king of Scotland in his place. The above code will display a video in the latest versions of Firefox, Opera and Chrome. But that’s it. You need to append the markup for the video to display in recent Safari, iPhone or Android releases. You need to append it further — with that busy Flash object embed from two boxes up — for the video to show in earlier versions of the above browsers, and, crucially, until Internet Explorer 9 comes out next year, in the world’s most popular browser. This page includes an annotated version of the full markup as well as the actual video. If you’re not using one of the above browsers, download one! Firefox, Opera, Chrome and Safari are each free. If you want to try this yourself, I strongly encourage you to read this chapter from the “Dive Into HTML5” online book. It’s long but totally worth it. It’s extremely informative, covering basics about digital video — starting with the difference between containers and codecs — as well as the HTML5 stuff, and doing it all in a way that’s accessible to n00bs without being condescending. Even before HTML5 as a whole is officially supported, developers can publish video in a clean, plug-in-free, standards-based format. It’s a way to display video on the Flash-less iPhone/Pad. Not supported on all browsers yet. No standardized codec. Having to develop for multiple codecs, still create a Flash backup, decreases the net benefit to workflow efficiency. Lots of accessibility potential. But right now, it’s mostly just that, potential. Use the poster attribute to customize the preview frame. This can be any image — it doesn’t have to be a frame from the video. Yes and no. For the average developer, it’s worth waiting until some of the issues mentioned above get worked out. But, make no mistake, especially with <video> tag support coming in IE9, HTML5 video should be ready for primetime soon. If you choose, you can already view most YouTube videos in HTML5. Vimeo also has an HTML5 player in beta.